New Orleans is known for its historic value and architectural beauty internationally, and visitors can see the proof for themselves throughout neighborhoods and down main streets. Even our cemeteries are beautiful and inspiring, and nonprofit organization Save Our Cemeteries works hard to raise money to maintain and preserve them for future generations. At their Saturday evening gala in early November, the organization hosted an evening of elegance and fun for guests and sponsors. 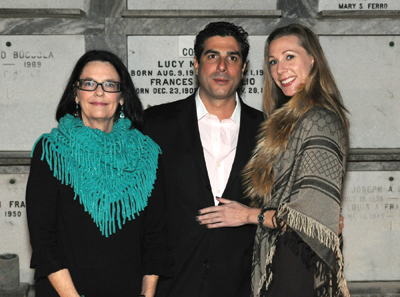 Chaired by Scott Duggins, the cocktail affair featured a patron party, cocktails, edibles, a silent auction and candlelit tours of the grounds. Patron party edibles were appetizers provided by Renee Bistro, while the main event was catered by Dickie Brennan’s and the New Orleans School of Cooking. The Courtyard Kings played at the patron party, while soirée guests enjoyed the sounds of jazz vocalist Sara Quintana. All proceeds of the event went to furthering the efforts of Save Our Cemeteries.